From left: Coun Malcolm Chandler, Coun Anthony Casson, Louise Ruddel police chaplain, Pastor Chas Sandhu, Marion Sandhu and Jenny Tedbury. South Holland District Council has donated £6,000 to the Spalding Street Pastors. 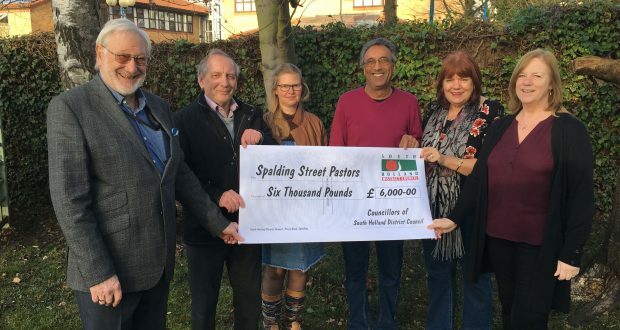 Street Pastor coordinator Marion Sandhu expressed her gratitude and said the funding will help secure the service for the foreseeable future. Spalding Street Pastors patrol the town centre every Friday and Saturday night, and have done so since July 2013. Volunteers from local churches, the street pastors are first aid trained and set out to help anyone in need of assistance. Working under the banner of the Home Office-approved Ascension Trust, Street Pastors work in partnership with South Holland District Council, Lincolnshire Police and Churches Together in Spalding. Coun Malcolm Chandler the SHDC representative has supported the Street Pastors since its beginning and is part Management Team and has frequently accompanied the Street Pastors on shift, as has Coun Anthony Casson, who called them “inspiring”.